So, I went to the Dr. for a checkup. First time in 4 or 5 years. Long story short; blood work came back good except my cholesterol is high. Not through the roof; but higher than it should be. Dr. told me I needed to cut out salt, cut out sugar, cut out desserts, cut out fatty foods, do some sort of cardio for for 20-30 everyday. Fine. 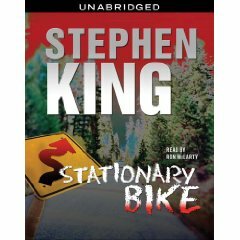 Finally, I realize that I have an audio book sitting on my hard drive by Stephen King called The Stationary Bike. I have no idea where I got it from or how it came to be on my hard drive. I like Stephen King and thought that I’d at least heard of every thing he’s written, but I’d never heard of this. I have no idea what it’s about. I decide that I’ll put it on my itouch, and listen to the audiobook and walk for 30 minutes (of course with Rhubarb). The first scene is the protagonist sitting in his Dr.’s office. He’s been putting off the checkup for 1-3 years. His blood work looks good except his cholesterol is high. Not through the roof, but higher than it should be. His cholesterol was 230. (Mine was 203). His Dr. proceeds to explain to him that he has been blessed with a “good” metabolism; not great. But good. The problem is that it’s getting older and he needs to stop eating and acting like he did when he was a teenager. His Dr. says that if he starts taking care of this now, it’s far from too late. But if he doesn’t do something soon, the fat’s going to start packing on and in 10 years, his health is going to be in serious trouble. Next scene, I find out he’s an artist. He’s an artist who feels he’s neglected his art for a long time and has only produced anything for monetary gain which has successful squelched his own creative impulses. This is the book that got me out of my chair to go walk the dog tonight.